This bizarre creature from the deep was found washed up on a Kent beach by a mother - who threw it back with her bare hands. The weird Sea Mouse - a type of marine worm normally found up to 6,600ft below the surface - had been flung ashore in a storm. 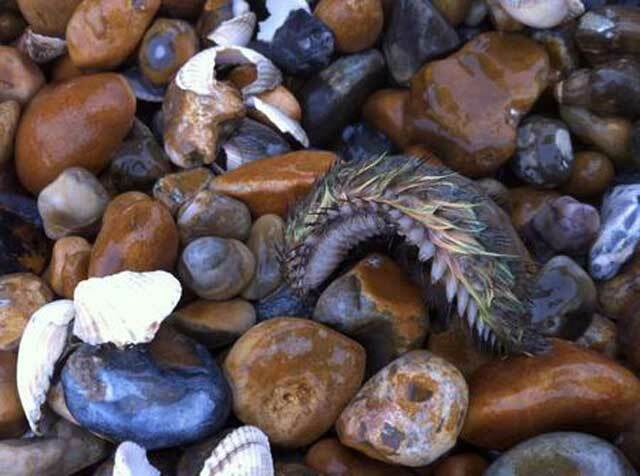 It was spotted by Julie Sherrard who saw its strange thick coat of brightly-coloured hair among the pebbles and shells. Animal-lover Julie, 48, said: "I first thought it was some sort of alien - the hair was in the most fantastic colours. "I have never seen anything like it before. It felt like a dead mouse - furry, very furry. It was still breathing, so I didn't want it to die. I chucked it into the sea and then had the horrible thought that it may not have been a sea creature after all." Julie, 48, was walking along Hythe beach near Folkstone with her six-year-old son when she spotted the four-inch long sea creature a fortnight ago. She added: "My son was absolutely amazed by its little legs. He told me not to touch it in case it 'got' me. I just didn't want to let it die." Sea Mice can grow up to 12 inches long and are normally found just below the intertidal zone on both sides of the Atlantic and in the Mediterranean. Their backs are covered with bristles which usually have a red sheen but flush green and blue in a remarkable defence mechanism. They are blind and find their way with feelers using small bristly paddle-like appendages, burrowing for dead and decaying bodies of other sea creatures. They are hermaphrodites, with functional reproductive organs of both sexes found in the same individual, and are often washed ashore after storms.